[New for 2015] I had every intention of buying a candy bar when I stopped in to 7-11 today. Oh sure, I heard about their new ice cream line up several weeks ago, but I already had ice cream once today so I figured I was good, well, until I saw this. WHOA. Doesn't that look awesome? 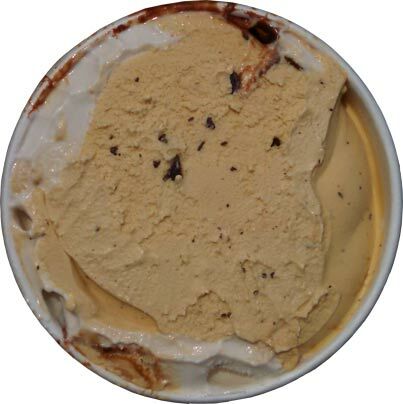 The gooey swirl is just leaping out of the pint, a bit of fudge swirl too, a nice graham colored base, hints of chips. Good times ahead! Mmmmmm, nice graham flavor. The texture is very smooth, in a somewhat unnatural way. The marshmallow swirl is.... not sure how to describe the flavor swirl as it's overridden by whatever it gets scooped with. It's still gooey fun none-the-less. 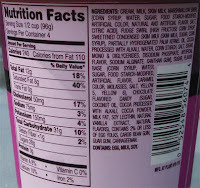 The fudge swirl is very much generic hersheys syrup, no surprises there. I think my only real comment here is that I would love this to be a more textured, all natural ice cream. Graham is a gritty thing and I like when that translates to a pint's texture. We don't have that here. We have a fair amount of chips which does help, but no true grit. Oh man, these puddles are just nuts. I just got one with both swirls and it was like a big scoop of Jell-o pudding. So much fun factor here. Great summer experience. There is plenty of craziness going on here to make up for not buying a candy bar today. I'm not really sure where to stop. I mean, what a crazy pint of ice cream. There is just so much swirl everywhere. I picked on the ice cream texture but so often I'm getting the swirl on my spoon and it just distracts in such a fun, pudding-like way. On Second Scoop: Fun factor in full effect here. 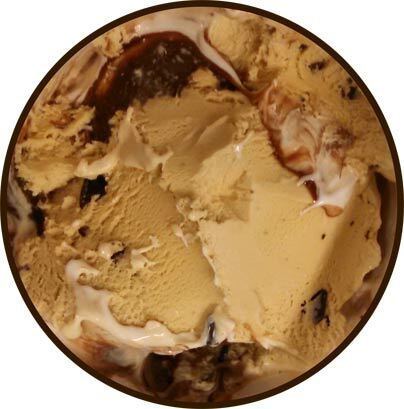 It's not a high end ice cream, but there's just so much fudge swirl that makes this really feel like a S'mores flavor. I will give the warning that people who do not like super sweet flavors should probably avoid this one. My tolerance is pretty high and even I can only eat about a third of a pint before being unable to proceed (that is meant as neither a slight nor an insult). Good times. At first glance, the marshmallow on the bottom looks like a hard-boiled egg. On another note, I was expecting the icecream to be light/low calorie because of the "Go!" Nutrition facts show the opposite, sadly. 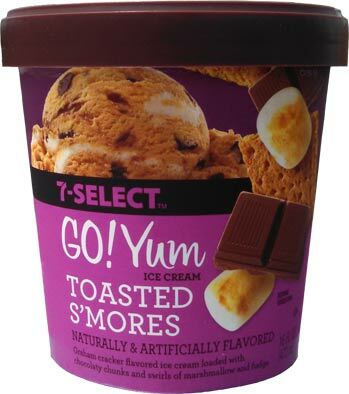 A S'Mores flavor that is gluten free, and I don't think there is a 7-Eleven any where near me. I'm going to go pout now. It looks so gooey and yummy! I used to work at a 7-Eleven, and they have delicious junk food. If you like the premise of one of their food products, (i.e. someone who doesn't like chocolate obviously won't like fudge brownies or chocolate cupcakes) it will almost always be really good. That sounds amazing. Are all seven elevens carrying the go yum ice cream products?! I live in California & I'm hoping to try them! @Anon: the ice cream is made in Iowa and distributed in Texas and I found it in New England so... should be national right? I adore s'mores ice cream flavors. Yesterday, I bought my favorite, Gifford's Campfire S'More as it was on sale. I've had the new Friendly's flavor as well but Gifford's still wins over that. You should never have to make an excuse for Ice cream over candy. Because real ice cream is almost always better. Then again ice cream always imitated candy. But candy rarely initiate ice cream. So maybe candy is the dream. I'm CA born n raised and have a really fond taste for 7-11 house brand vanilla. Bought this smores flavor tonight cause I love smores "when done right". If Ben & Jerrys had made this it would have had A:Texture, there is nothing in this pint that resembles an actual graham cracker. 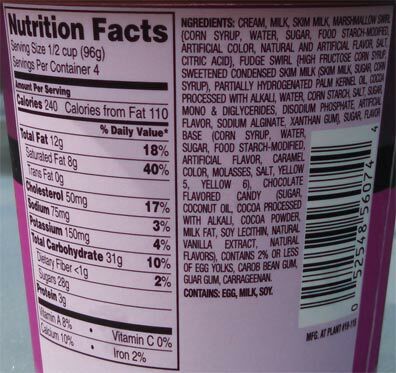 Laboratory created "graham cracker" flavor? Gag me with a spoon! B:Marshmallows: Give me some REAL mini-marshmellows, gotta be better than this liquified "marshmallow syrup" (yes, SYRUP, too thin and runny to be marshmallow cream. C:Hersheys syrup is a perfect description, except it's Not Quite Real Hersheys quality. Lab produduced choco syrup taste. Finally: sweetness: enough sugar content to send your brain into "shutdown mode". Summary: never again, I'll go back to their plain vanilla! I discovered this ice cream today and I love it. I am pretty easy to please though. Yes it's very sweet. My favorite part is the ooey gooey marshmallow and the delicious chips. I'll definitely buy it again. There goes my diet. The banana cream pie is awesome! !